After many years had passed, the Israelites sinned against the Lord and He let the Midianites oppressed them. The Israelites built for themselves shelters on the mountains. Whenever the Israelites had sown seeds for their crops, the Midianites will come up and destroy their cops. The Midianites also killed all their livestock. The Israelites cried out against the Lord and the Lord sent Gideon to deliver them out of the oppressions of the Midianites. It happened that the angel of God came to sit down a terebinth tree in Ophrah. At that time, Gideon was threshing the wheat in the winepress. Then God told Gideon to take his father’s young bull, and a seven years old bull and then go to the temple of Baal and cut down the wooden image to make an altar for the Lord. Gideon did as God commanded him. When morning comes, the people of the city were angry to find the image of Baal was cut down and wanted to kill Gideon. Then Gideon sent message to the tribe of Manasseh, Asher, Zebulun, and Naphtali to join him in his battle against the Midianites. The next morning, Gideon found the fleece of wool on the threshing floor was wet and he squeezed out the water in a bowl. Gideon decided to test the Lord again. The next day, Gideon found there is only dry wool on the threshing floor but there was dew all around the floor. So 22,000 men returned to their home and only 10,000 men are left. Three hundred men lap the water with their tongue and the rest knelt down to drink water with their hand. And so Gideon sent the rest of the men who knelt down to drink water home. 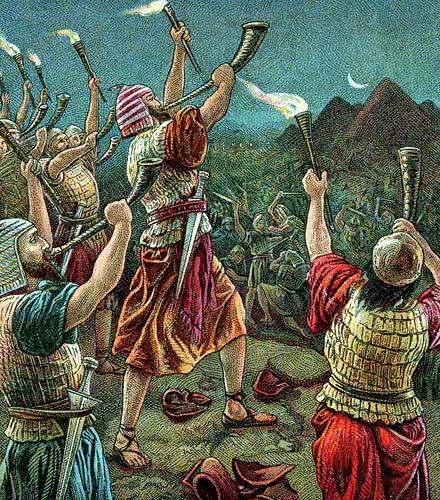 Then Gideon gave a trumpet, empty pitchers, and torches inside the pitchers to each of his men and gave them instruction to break the pitchers and shout out aloud “The sword of the Lord, and of Gideon” (King James Version. Judges 7:18) when he gives the signal. Gideon and his men came to the outside of the camp. Gideon gave signal and blew the trumpets and his men gave out a loud shout. All the people in the enemy’s camp were in confusion. They started to kill each other. That day, the Lord delivered the Amalekites and Midianites into the hands of Gideon and his men.